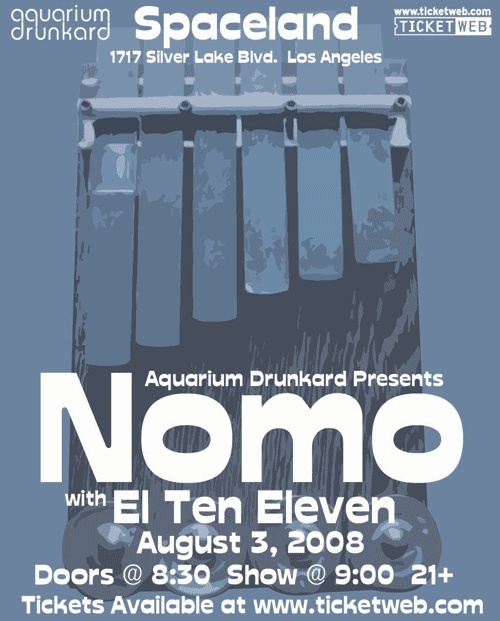 August 3rd: Touring behind their new (and excellent) LP Ghost Rock, Aquarium Drunkard presents Ann Arbor, Michigan’s NOMO at Spaceland. I was introduced to this band by chance in 2006 at SXSW when I, literally, stumbled into their set. While at a Jay Bennet show (that was beyond awful) I walked into the other room at the club to get away from it. The band playing were both unique and amazing – when they were done I asked them what there name was. They replied “we’re NOMO from Michigan.” And here we are. We have five pairs of tickets to give away to AD readers. To get them there hands on a pair leave a comment below with you name, and a valid email address. + Download NOMO via eMusic’s 25 Free MP3 trial offer. These guys are supreme! I’ve seem ’em many times and can’t wait for their show here in Madison. My friends were fortunate enough to have Nomo play their wedding which made the night all the more amazing!